Anthracite coal is a carbon-rich fuel typically found in mountainous areas. It spends a greater amount of time underground than traditional, bituminous coal and as such, has been subjected to additional pressure and heat. Due to these compressive conditions, anthracite coal is hardened significantly, thus improving its ability to produce a vast amount of heat when burned in appliances such as multi-fuel stoves, gravity-fed boilers, room heaters, cookers and so on. Anthracite coal is suitable to be burned within smoke control areas on account of its low pollutant content. It is made up of 80-95% carbon, leaving only trace amounts of remaining harmful substances such as sulfur and nitrogen oxide. Further, it has a very low moisture content of just 5-15%, resulting in a desirable slow burn. How is Anthracite Coal Formed? Anthracite coal is classed as a metamorphic rock that is formed in areas of the Earth that experience a great degree of movement. For example, anthracite will generally be found in mountainous areas, in volcano ridges or places that are prone to earthquakes. Continuous tectonic plate shifts are what cause the previously-mentioned compressive conditions that anthracite is subjected to before the mining process begins. Heat output & fire life - On account of the high density and low moisture content, anthracite coal is the hottest of its kind, burning at 900 degrees or higher with a sustained fire life. Clean burning - As mentioned, anthracite coal emits a low amount of toxic substances because of its carbon-rich make-up. Low ash & soot content - Anthracite coal is clean to touch and burns to a tight residual ash content that is easy to clean from the grate of closed appliances. 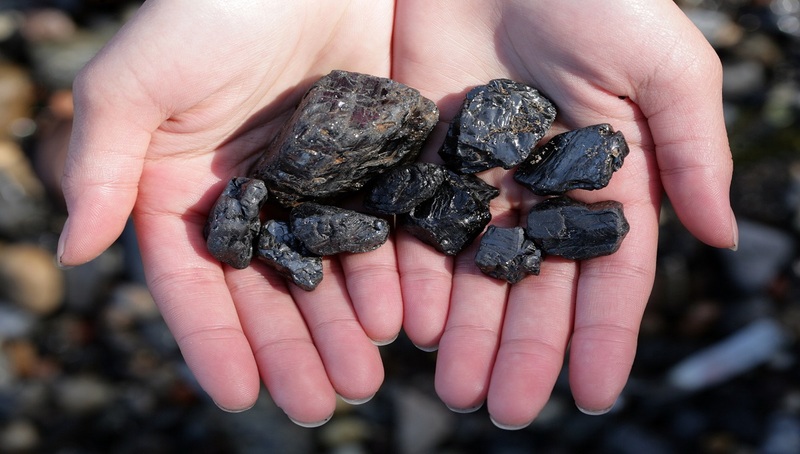 What is Anthracite Coal used for? If you are unsure about the uses of anthracite coal, don’t worry. Below, Coal Hut has provided a list of anthracite coals available online at CoalHut.com, along with the corresponding appliances in which they are best suited. Burnglo Anthracite - A cost-effective-yet-reliable smokeless fuel for multi-fuel stoves. Burnglo is a standard quality anthracite that burns with a low flame, producing a good level of warmth and a compact ash residual content. Anthracite Beans - Made from premium-quality Welsh anthracite and best suited to gravity-fed or hopper-fed boilers. Anthracite Beans have an extended fire life that is sure to heat your home for hours on end. Phurnacite- The highest quality manufactured smokeless ovoid available on the market today. Phurnacite is made from compressed anthracite dust and, when used in the likes of room heaters and cookers, it produces optimal heat output. If you want to view the rest of our anthracite coal and smokeless fuel range, visit CoalHut.com. We also supply industry leading bituminous coal and a range of logs and wood pellets. Just pick your favourite fuel, enter your postcode and delivery schedule, then you’re good to go!